When staff needed a way to send or receive exam reports and test results, they turned to TigerConnect to integrate with their EHR. Waterbury was able to reduce a patient’s length of stay by nearly two days, helping them save more than $2,208 per patient. With the ability to communicate and receive test results containing PHI through TigerConnect, Waterbury Hospital physicians are now able to connect and coordinate care with one another instantly. Their consult turnaround times have drastically decreased while overall workflow efficiency increased. 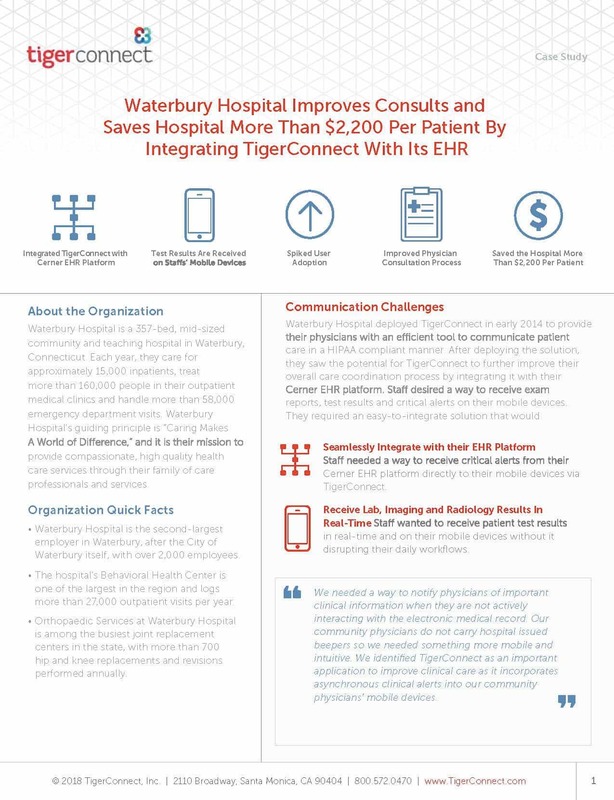 Additionally, by utilizing TigerConnect’s integration capabilities, Waterbury Hospital has significantly improved user adoption, reduced patients’ length of stay, and saved thousands of dollars.